It was a sort of child’s way of blackmailing for candy. To get lollipops. “Whenever I would see candy – I would run and get it,” he says. He also remembers a time when life wasn’t as expensive as it is now. “I used to buy eggs for 50 cents. People used to say, ‘That’s so expensive… we would never pay that.’ I remember when you could buy a sheep for l Birr. Food prices aren’t the biggest concern that Wendwosen has faced in the past years. Today, his biggest concern is his eye sight. For the past few years, he’s been slowly going blind. For the last 3 months, he hasn’t been able to see anything at all. How life has been without being able to see. Blindness did more than make Wendwosen feel useless. It also separated him from the people he loved – and the events of his life that were important to him. All of Wendwosen’s children are students – all of them still in school. The youngest is 18. The oldest is 21. Their studies keep them busy. Too busy to help their father care for his livestock. He didn’t want them to stop school to care for him. He values their education – their futures – more than he values himself . 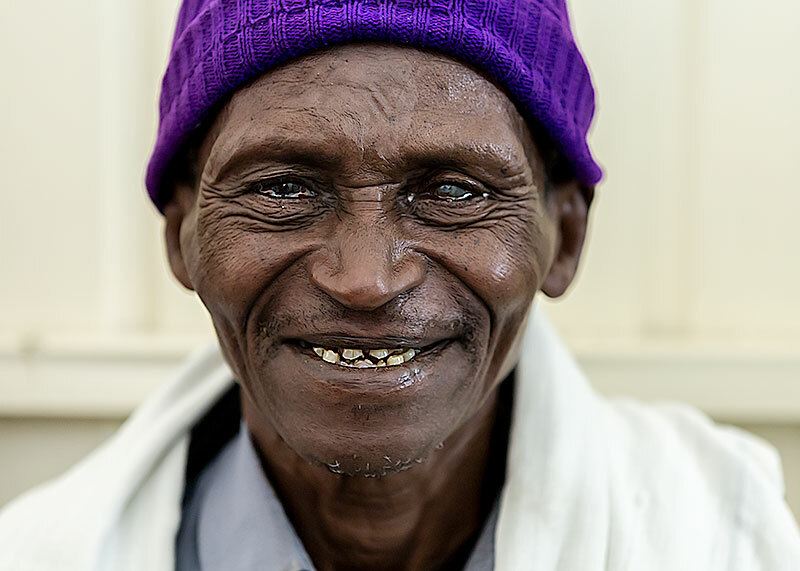 And so Wendwosen came to Hope and Healing International’s partner eye hospital, St.Francis. Hoping to have his sight restored. We meet Wendwosen the day after his surgery. He’s waiting in line for the bandage to be removed. Waiting to see again … As the nurse peels back the tape, a smile breaks across his face. He can see!